Unbeatable metals for very high power. The Power Transmission and Distribution (T/D) business unit develops durable and extremely temperature-resistant switch contact systems. Our customers use these systems to control voltages of up to 1 200 kilovolts and currents of up to 50 kiloamps. Arcing generates temperatures of up to 20 000 °C. Where conventional metals would fail, tungsten-copper (WCu), copper-chromium (CuCr) and tungsten carbide-silver (WCAg) keep a cool head. Switching contacts made of tungsten-copper are relied on to interrupt and connect the electrical circuit even at high voltages. Indestructible: With their high wear resistance and optimum arc erosion properties, our arcing contacts can reach a service life of over 40 years. Ready for installation: The contacts alone are not enough - we assemble and connect all the necessary individual parts of the moveable and fixed switch contact and supply you with the complete contact system ready for installation. Uncompromising quality from a single supplier. We use powder metallurgy to produce our metallic composite materials. The benefit to you: perfectly harmonized material properties and an exceptionally homogeneous material composition. With modern joining technologies and fully automated production lines Plansee Powertech in Switzerland manufactures high-precision switch contact systems. From the raw material to the finished product, we handle every production stage in-house: In this way, we guarantee top quality and the reactivity needed to meet your requirements. Your satisfaction. Is our reward. We work with the world's leading power engineering groups. Many of these have been calling on our experience for years. ABB appreciates the quality we offer and has chosen us for its top supplier award. For the tenth time in a row. Do you have a new idea? We'll help you put it into practice. From the prototype through to series production, we will work closely with you to develop the most efficient and weight optimized arcing contact system. In this way, we help extend the lifetime of the circuit breaker and reduce the maintenance costs. With our ready-to-install components, we simplify your logistics chain and inventory management. 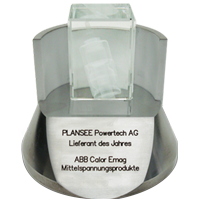 The Plansee Powerteam specializes entirely in the field of power engineering. It is your challenges that inspire us to achieve top performance every day. Our product developers will identify the best material and design solution for your application.